From embroidery to screen printing and more … It’s no problem for Marketing Tools Inc.
We not only offer embroidery and screen printing services on-site and with local partners, we're fully staffed and have the means to handle any project. 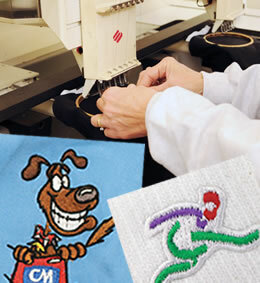 We offer a collection of embroidery designs that are second to none. Use your logo or a special product/promotion logo designed by our staff to customize t-shirts, sweatshirts, hats, uniforms, jackets and much more. We're high quality producers of embroidered and screen printed branded wear and can meet whatever need you may have, whether it's screen printing on T-shirts for a special event, Folders, Signs, Stickers, Notepads, Trade Show materials, Canvas Bags, etc. ; embroidery for golf shirts for a company tournament, jackets for outdoor workers, hats or jerseys for an athletic team, we'll make your logo stand out. Ask about other decorating options we offer! For apparel, we care a range of exclusive brands such as Gildan, Cutter & Buck, Columbia, Carhartt, Nike, Under Armour, nearly any brand on the planet. Talk to one of our professionals today and experience the difference quality and attention to detail make!